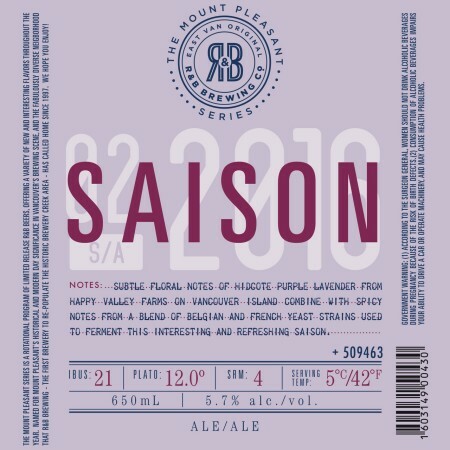 VANCOUVER, BC – R&B Brewing has announced details of the latest release in its Mount Pleasant Series, named for the East Vancouver neighbourhood where the brewery has been located since opening in 1997. Subtle floral notes of Hidcote purple lavender from Happy Valley Farms on Vancouver Island combine with spicy notes from a blend of Belgian and French yeast strains used to ferment this interesting and refreshing Spring Saison. R&B Saison is available now in a limited run of 650 ml bottles and on draught while supplies last. In conjunction with the new beer release, the new R&B taproom will be opening in late March, featuring 12 taps, 2 cask engines, local wine and cider, and hand-made pizzas. For more details, see the R&B Brewing Facebook page.